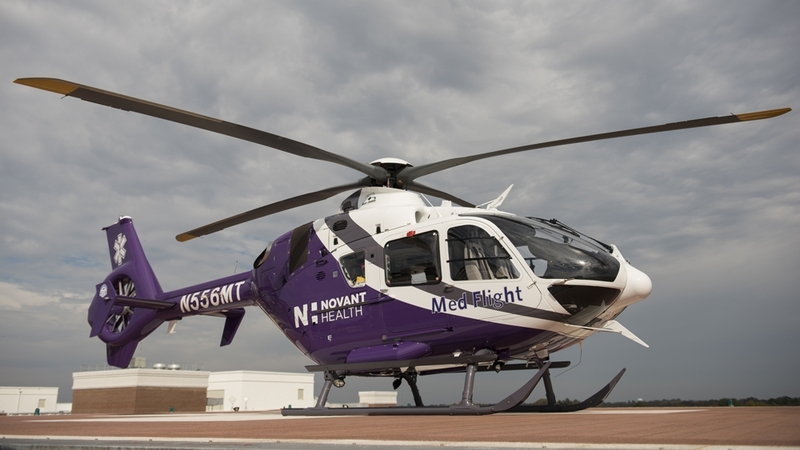 More than a century later, the newest medical helicopter in Paul’s state is Novant Health Med Flight, a new aubergine-colored Airbus H135. Novant Health Med Flight, equipped with the latest medical technology and safety features to offer both emergency and critical care, covers roughly 170 miles in any direction, including the Charlotte and Winston-Salem areas, from its home base at Novant Health Rowan Medical Center in Salisbury. This new capability allows Novant Health to significantly reduce the amount of out-of-hospital time for some patients in need of time-sensitive treatment. As you consider the capabilities of Novant Health Med Flight, it’s worth noting how far air ambulances have come. Very often, advancements in medical helicopter use in the United States is traced to wartime innovation from the U.S. military. This type of development is well represented in pop culture, as well, through the classic TV show “M.A.S.H.” (“Mobile Army Surgical Hospital”) whose popular Trapper John character was based on a real former airman, Dr. John Lyday, from Greensboro, North Carolina, who served during the Korean War. While the U.S. Army first employed a converted airplane for patient transport in the 1920s, the routine medical evacuation work of helicopters transformed more notably in Korea in the ’50s. Roadways in Korea were generally rugged and inefficient. The Vietnam War, coming later in the ’60s and ’70s, brought medical advances that included in-flight medical care. Helicopters likely deserve a good share of the credit for improvement in “deaths per 100 injured” statistics throughout American military history, according to a public policy paper by the MedEvac Foundation International . Those historical mortality numbers were 50 deaths per 100 during the U.S. Civil War, 8.5 in World War 1, 4.5 in World War II, 2.5 in Korea and finally fewer than 1 per 100 during Vietnam. Following some of those later conflicts, military surgeons took many of the most successful concepts back with them after the war and applied them to the medical and aviation fields at large. In more recent years, one of the popular misconceptions about medical helicopters, Ward said, has been that many in the public still associate the helicopters’ use exclusively with trauma cases. Ward said the modern medical helicopter allows patients who are sometimes being transferred from one hospital’s ICU to another’s to never really be outside an “ICU” setting, even when they’re midflight. Novant Health Med Flight, for example, will be staffed with a flight-registered nurse and a certified flight paramedic. The modern “flying ICUs” and “flying critical care units” cruising at a speed of 158 miles per hours, Ward said, have truly come a long way from their humble, and often combat, beginnings. Terrain avoidance: “When the altimeter senses the pilot is getting low, there’s a voice that goes on the intercom of the pilot’s helmet that goes, ‘altitude, altitude.’ It even says, ‘500 feet, 200 feet,” Ward said. 100 percent night vision goggles : “There’s no more landing in a pitch-black spot at night on the side of the road for the pilot to pick up an emergency patient,” Ward said. IFR (instrument flight rules) capabilities: “The autopilot can be engaged by the pilot and this aircraft will fly itself to a runway and down a runway heading like an airplane and stop its descent at 70 feet. Then, at that point, the pilot can take over and land it or the autopilot system will take it back in a predetermined pattern that all airports have,” Ward said. A ventilator and a heart monitor: Both tools are similar to what a patient would see in a hospital. The heart monitor includes invasive monitoring capability similar to what a patient would see in an emergency room or intensive care unit.